Welcome to my travel blog. Hope you have a nice stay! We arrived in Shanghai in late January, 2017 and I spent most of 4 months teaching at NYU-Shanghai and doing some traveling on weekends and vacations. After the semester was over, we had about 3 weeks before returning to the USA so we decided to explore western China. In most of our travels, we’ve usually had a fairly fixed itinerary with at least approximate times and locations scheduled from reading guide books or discussions with other travelers. Lil favors having everything planned while I like to have some flexibility to potentially depart from the itinerary if something else interesting comes up. This trip was our ultimate ‘plan as you go’ trip as little was pre-planned and at least for me it was our most interesting and satisfying adventure. One reason for the lack of planning is that this area of China has no railroads and few airports so almost all of the travel is by bus or taxi. So we couldn’t buy tickets in advance for travel from city A to city B. As we would discover, the impromptu nature of traveling in this area of China is normal and makes it unpredictable, adventurous, and memorable. This trip took place from June 16-28, 2017. Map of the sites visited in Yunnan and Sichuan. Note that there is a sharp line just west of Chengdu where the number of roads drops precipitously. While the famous hike in China, Tiger Leaping Gorge, is in Yunnan, it is really where our adventures in Sichuan began. Lijiang is the usual departure point for hiking the Tiger Leaping Gorge. We were staying in a lovely Airbnb in Shuhe, a small suburb of the larger village of Lijiang. We took this Airbnb on the advice of our friend Ann Chen and it was a good decision. Lijiang is very scenic with one of the iconic views in China of the Jade Dragon Snow Mountain with the Black Dragon Pool in the foreground, which is featured in many tourist brochures. When we were there, the day was nice and sunny but unfortunately, the mountain top was hidden by clouds. The old town of Lijiang is also very nice and built on a slope that gives splendid views. However, Lijiang is very touristy and noisy with many bars blasting loud music at night, or afternoons. On the other hand, Shuhe is quieter with nice quaint spots and an easy taxi or bus ride from Lijiang. Shuhe also had the best water quality that we saw anywhere in China. Many Chinese cities have small rivulets or streams running through the streets but in most of them the water quality is so bad that I’d hesitate to use it to wash my hands. It’s also disheartening to see what the local population throws into the streams. By contrast the waters running through Shuhe are crystal clear and look drinkable. Our Airbnb host said that the native Naxi ethnic minority had a custom of having three collection pools of water to filter it. Originally we were going to tackle the Tiger Leaping Gorge ourselves as is our custom to eschew guides, but Lil was worried about doing this without a guide so we opted to hire one. Luckily we had met with an old acquaintance from Madison, Jeanee Linden who runs a very successful boutique hotel (Linden Centre) in a historic renovated Bai style courtyard home in Xizhou near Dali, where we were before coming to Lijiang. 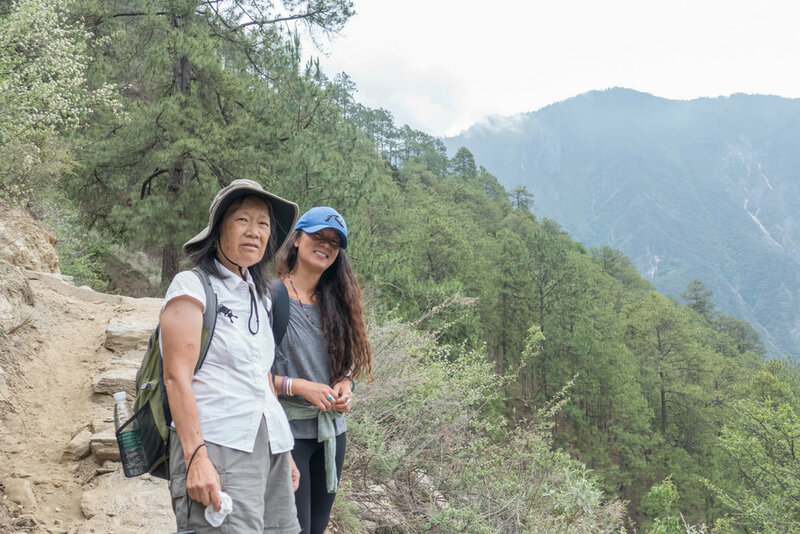 Jeanee recommended a Tibetan woman, Pema, who had worked for her who was very knowledgeable about the areas in western Sichuan and northern Yunnan. We called her and arranged for her to accompany us on the TLG along with a driver. This turned out to be a great decision but not for the reasons that we had thought. This hike, despite its reputation, is not particularly challenging except that it is at a rather high altitude (about 9000 ft) and could be problematic if the trail is muddy. What probably gives it a reputation for being difficult in China is that, unlike all the other hikes we did in China, this one is not paved and has no stairs so it is more like a traditional hike, as opposed to a walk. It is the only time when I was glad that I brought my hiking boots and carried them all around China for 6 months. In none of our other hikes did you need anything more than sneakers or sandals. We took what is called the upper trekking route which is high above the gorge where there is a fair amount of elevation change with majestic views. One can also take the lower trekking route along the gorge where you are close to the surging water, but you are hiking along a busy road and cannot appreciate any of the great scenery that you see from on high. Most of the Chinese tour groups are at the lower gorge which is another good reason to take the upper trek. On Pema’s advice we did not start the hike at the traditional start point Qiaotou, but instead we had the driver take us to the Naxi Guest House which avoids the first 2 hours or so. The main reason for doing this is to avoid a massive construction project across the gorge to build a high speed rail station. The noise and visual pollution from the construction greatly detracts from the esthetics of hiking in ‘wilderness’ which was confirmed by the fellow hikers we met later (see below). 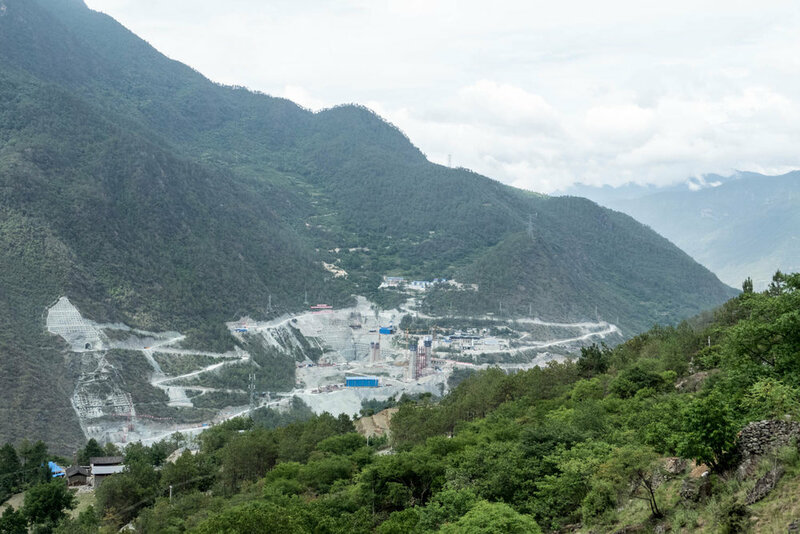 Once the high speed rail station is finished, it will make it much easier for the massive crowds of Chinese tourists to come to the gorge, which means that it will greatly change its character in just a few years. So if you are planning to take this hike, you best do it soon! Our hike then began with the ’28 bends’, which is a steep uphill portion of the trail. This is one of the steeper, if not the steepest, portion of the trail. If you find yourself having difficulty with the climb, there is the option of taking a donkey up for a price. At this point in the hike, you are past the loud construction and the scenery becomes much more pleasing. 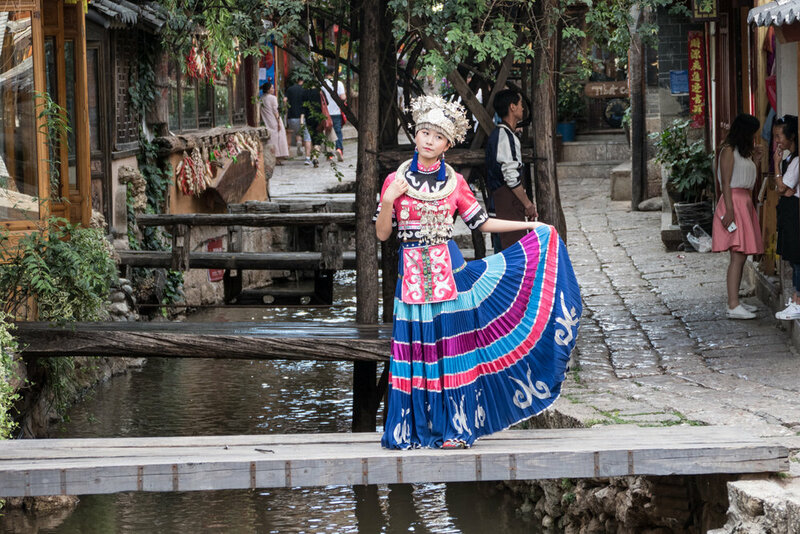 At the most impressive vistas, a local Naxi woman guards the spot and charges a small fee if you want to take a picture. They also provide you with the possibility of buying some “energy boosters”, like marijuana. About 5 hours from when we began the hike, we arrived at the Tea Horse Inn Guest House where we stayed for the night. We could have pushed on to the next guest house, Half-Way House (which is inaccurately named since it is more than halfway along), but Pema said the facilities and food were better at the Tea Horse Inn. Again, she was correct. When we arrived at the Tea Horse a few other groups also trickled in, and most of them stopped to get a drink or snack and savor the nice viewing platform of the Gorge. When talking to several of the groups, we advised them to talk to Pema about whether to stay the night at Tea horse or push on. In the end several of these groups took her advice to stay and we would later become friends over dinner. One of the first things I did at Tea Horse was to order a cold beer which was marvelous after the hike but a surprising thing to me was that no one else in the various groups did that, even though there were German and Dutch guys. We were the first to sit down for dinner and I chose a large table rather than a small one for just the three of us. This was a good decision because we were immediately joined by three other groups: a German couple (Manuel and Caroline), two Dutch guys (Sidney and Tom) who were cousins, and a French guy with his American girlfriend who were on vacation from Hongkong. We discovered that the German and Dutch groups were both just traveling around the world, not really on vacation, and had been on the road for several years. They were traveling on limited budgets, stopping to work now and then and then going back on the road when they could afford it, which is why they didn’t order beers. Very quickly it became apparent that we were of like minds: travelers with a sense of adventure to explore well off the beaten path. Of course the dinnertime conversation covered various traveling destinations and adventures. For example, it turned out that almost everyone had been to Broome, Western Australia which is a very small but scenic town famous for being hip and for sunsets on the beach. A lively discussion ensued that lasted late into the night with a nice vibe. It was helped by the landlady of the guest house who offered free beers at one point (everyone eagerly accepted) and then near the end of the night she came around with a free pizza! Part of the reason for her generosity was, I think, that Pema was responsible for talking several of the groups into staying at the guest house that night. Our guide Pema actually was an important part of the conversation even though her travels were limited to China and Tibet. There was of course discussion of where to go after completing the hike. We were completely open-ended as the last thing on our list was to do the Tiger Leaping Gorge hike. Pema had traveled extensively in western Sichuan, an area which has a heavy Tibetan influence. All of us were interested in going to Tibet but travel there is very difficult. First you have to get a travel permit, and you need to have a guide and a fixed itinerary. I had inquired about getting a permit to go to Tibet and was informed they needed at least 3 weeks to process the permit and we only had 2 more weeks before we had to leave China. Pema said that the towns in western Sichuan are in many ways like going to Tibet before the Chinese started imposing heavy restrictions on the Tibetans. She drew a rough map of the towns in western Sichuan that one could visit to get a Tibetan view. Because there are no railroads and few airports in the area, all of the travel is by bus or minibus taxis. She emphasized that you need a lot of time to visit these towns because travel was slow and unpredictable with long distances and frequent road closures. All of the groups around the table had a copy of her map, and as it turns out, many of us followed her advice as we were going to run into them at various stops in Sichuan. So the decision to hire a guide led directly to our choice of our next destination –Tibetan towns of western Sichuan. On the next day we completed the hike gradually making our way downward. Interesting sights along the way included a herd of goats that looked like they owned the mountain and a pretty waterfall in the middle of the trail. We came off the trail at Tina’s guesthouse where our driver was waiting. We then drove along the lower trail to where all the tour busses were parked which had a long stairway to the level of the gorge. The amount of water rushing through the narrow gorge is impressive and it’s easy to see how the natives came to worship this area. Pema is a devout Buddhist and she had offered to take us to visit a Buddhist monastery on the way back to Lijiang. So we spent a few hours at the impressive Zhi Yun monastery as well as seeing what life was like around the small village where the monastery was located. We returned to Lijiang in the early evening, in time for a leisurely meal. 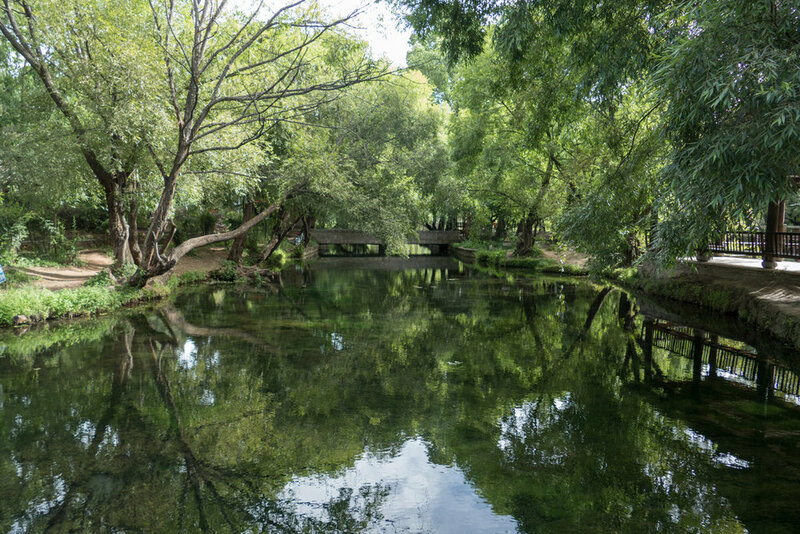 There are several cities in China that call themselves Shangri-la. The one in question is located about 8 hour bus ride northwest of Lijiang. On Pema’s map this city is the jumping-off point for western Sichuan. She had recommended getting to Litang as fast as possible since neither Xiangcheng nor Shangri-la had much to recommend it. Shangri-la had a bad fire three years ago in 2014 which destroyed many of the ancient wood buildings and houses in the old city so the city was in the midst of rebuilding and was not as picturesque. The plan was to take the bus to Shangri-la to stay for one evening and then take another bus to Xiangcheng, another 7 hours away to catch yet another bus for a 6 hour ride to our destination Litang. So from Lijiang we headed north on an 8 hour bus ride that left around 8 AM to Shangri-la, where we stayed one night in a hastily booked Airbnb in the old town. The place was fine with a nice view out our window of the big temple in town. We decided to go to dinner at a restaurant recommended in our guide book (Café Karma but it was said to be difficult to locate) and the old town was a maze of streets, none of them labeled, with new construction everywhere. But we had an address and a phone number so I called them to make sure that they were open and to make reservations. She said that if we made it to Sifang Jie (central square) in the town she would send someone to pick us up. We were very tired from rushing around trying to find a bank so we got a taxi instead. Well this turned out badly. The taxi cab driver spoke to the woman but from what I could understand of the conversation, they each didn’t know where the landmarks the other was mentioning. From our GPS and map, it seemed like we were entirely in the wrong section of town. Finally the driver drove in front of a central police station and parked waiting for the woman to appear. After waiting for some minutes, he got impatient and he told us to pay him and get out. After waiting another 10 minutes or so with phone calls to the restaurant where she assured us they would come to pick us up, a lady did appear on foot. So she was not picking us up in a car as I had assumed but simply taking us by foot to the place. It wasn’t a long way but it would have been hard to find. After all of that the dinner turned out to be terrific. It was in a 250 year old house with an atmospheric and nicely decorated inside. The hosts were very friendly (how often have you been picked up to go to dinner by the restaurant?). Only down side is that we were the only customers. Such a shame! And the food was excellent and not that expensive, the set menu of yak meat and mashed potato or yak stew was 100 yuan. It included a really tasty salad with cheese, steamed momos, and a pita like bread with sauce. Dessert was fruit and yoghurt. We actually had a difficult time finding our way back to our Airbnb even though we thought we knew where it was on our map. After several false starts, we finally found someone who directed us to the right place. The next day was quite an adventure. The plan was to take the bus to Xiangcheng, which left at 8 AM for the 7-8 hour trip. The scenery was magnificent but the road was really bad and bumpy though the driver was pretty skilled and friendly. At a break I talked to him and asked him about the busses that serviced the various towns in the area and that we were only staying in Xiangcheng one night because our real destination was Litang. He was quite informative about the busses that were available and durations of the trips. When we finally got near Xiangcheng there was a police stop where they come on board to collect and check everybody’s ID. While the police were checking the IDs, another man came on the bus, walked down the aisle, stopped next to me and surprisingly asked if we wanted to go to Litang that night. I didn’t know how he knew we wanted to go to Litang but indeed going that night meant that we could save an entire day of traveling. I asked the price (100 yuan) and duration (another 3-4 hours), which seemed like a good arrangement for us to save a day. However, I was a bit dubious about changing our plans in midstream and going with this driver of unknown origin. One hears stories about tourists being kidnapped by drivers of ill repute and forced to pay a ransom, or worse. I asked our bus driver privately if this was legitimate and he assured me it was all right. Basically I made a judgment call that our bus driver’s advice was believable. I asked him to confirm that the fare was 100 yuan and, interestingly, especially because of what happened next, he said that I shouldn’t pay the driver yet because it might only be 80 yuan. Meanwhile, there were 3 other passengers on the bus who were also intending to go to Litang. So the five of us gathered our luggage and transferred to the car but then there ensued a hitch. It turned out that the other passengers only wanted to pay 70 yuan. And if they didn’t go, then the driver didn’t want to take just the two of us. So people started getting out of the car. At that point our bus driver stepped in and asked the other three if they would be willing to go for 80 yuan. When they said yes, then he asked the driver if he would accept 80. So it was a deal. I don’t know if this was pre-planned or if the bus driver had seen the drill before. Later I found out that our bus driver had Wechatted with the driver to let him know that there were passengers on the bus who wanted to go to Litang and told him to meet the bus at the police stop. In retrospect, it’s not clear why they didn’t do this transfer at the more obvious place, the bus station in Xiangcheng. I suspect our bus driver must have gotten a cut of the fare or he and the other driver were helping each other out in some way. It didn’t make sense that the bus driver who was ostensibly working for the bus company would help funnel passengers away from the bus. In any case this was our first of several odd experiences with the mysterious business model of transportation in this part of the country. After transferring our luggage to the taxi the other 3 riders wanted to have dinner first though we were anxious to get on our way. Since we hadn’t planned on staying in Litang until the following night, we didn’t have a place to stay for the night. So during dinner I hurriedly found a place on Airbnb which looked decent (Litang Summer International Youth hostel, a student hostel, but they had single rooms and turned out to be ideal for us) and called them to reserve a room. In talking to the guy from the hostel, he expressed doubt that we could make it there in time before he locked the door at 11 pm. It was around 5 pm and he said he had just driven that route in the reverse direction this morning and it took him 7 hours. Note that the driver had estimated 3-4 hours and we would be driving at least part of it at night. After a leisurely dinner, during which time we picked up 2 other passengers, we then drove off but ended up at a car wash first. Admittedly the rear window was virtually opaque but the need for carefully cleaning the hubcaps was beyond me. After the car wash we had to then go to the gas station to fill the tank. Getting gas in a taxi is also an interesting experience as there is a law in China that the passengers cannot be inside the car while it is being refueled. So the driver had to let us all out to wait on the curb while he filled the gas tank. It was probably about 5:30 before we finally hit the road, but before we made it out of town we hit a road block. A steam shovel was clearing a large landslide that left a pile of dirt in the middle of the road and traffic was stopped in both directions. A motorcyclist when confronted by the roadblock got off his bike and went down to confront the man working the steam shovel. Not sure that did any good. Anyway, we finally got going again after the lengthy delay only to be stopped again by a huge rock sitting in the middle of the road. Luckily a front-loader was already there slowly trying to roll the rock down the ravine. Another 10-15 minute delay and we were off again. The road was in terrible shape, really only a single lane with just enough room barely for a car and truck to pass. Large ruts made us bounce continuously. Then the driver suddenly stopped the car at the side of the road, got out, and inspected the left rear tire. Apparently it didn’t handle normally and sure enough the tire was going flat. Luckily we were near a town so he pulled into a shop where he could pump the tire back up and feel the air coming out of a small hole. So another delay while we changed tires. By now I was pretty worried that we wouldn’t make our hostel before it closed but I called the hostel to give him a report, he was sympathetic and said try to be here by midnight. As it turned out we arrived before 11 (the driver drove very fast). Once I got the driver engaged in some conversation he was a reasonable guy but he’s definitely the type of guy who when confronted with a queue, just marches up to the front and butts in. He did that several times during our ride. Once when the road narrowed to a single lane and there was another car coming up the lane, he simply drove up so the cars were head to head. At first the other driver refused to back up and said that we should back up. Our driver said it was easier for them to back up so there was a momentary stalemate where neither moved. A passenger in the other car got out, ostensibly to see how easy it was for us to back up. Finally the other car gave up and backed up. During the last couple hours of driving to Litang, I made an effort to engage the driver in conversation because he looked like he was falling asleep. It turns out that his standard model of getting passengers was to wait at the bus station in Shangri-La and look for passengers who wanted to do what we wanted, namely get a ride from Shangri-La to Litang in one very long day since the busses required 2 days for this trip. But that morning he had gotten up late and missed the bus when it left at 8 AM. So instead he Wechatted with the driver to find out if any of his passengers wanted to go to Litang directly. It turns out that this is not an unusual way for getting riders as we would learn. We stayed 3 nights in Litang, which proved to be one of the most interesting cities in a country full of interesting cities. Litang is like a scene from the old wild west in the US. On the one hand it is a well-known religious city with a large Buddhist monastery and famous for being the birth home of two of the Dalai Lamas. So, monks in robes are a common sight on the streets and most of the people are Tibetan and do not look like the Han majority that you see in most of China. On the other hand the town has many people who look like Tibetan cowboys: the only thing missing are the Colt 45s. Cattle and pigs wander the streets unattended, dodging the monks flying by on their motorscooters. The big event in town is a 3 day horse festival, with many horse races and other events featuring horses. One year someone carried a photo of the present Dalai Lama at the parade and the government cracked down after which a riot ensued. The government then forbade the horse festival but apparently the city continues to celebrate it surreptitiously. So the city has a reputation for being independent and strong minded. When we checked into the youth hostel, we discovered in the ‘bar’ our two Dutch friends from TLG. It was fun to chat with them on their experiences since we saw them last at the Tea Horse Inn. There was lots to do in the city and the Tibetan natives were exceptionally friendly. While walking around downtown, we saw many people entering a doorway. When I peaked in to see what was going on, a fellow inside smiled and motioned for me to come in. The room had four massive Buddhist prayer wheels and there were many people walking around, always in a clockwise direction, turning the prayer wheel. Many of them were elderly and carried a hand prayer wheel which they spun, in a clockwise direction, as they walked around. This is one of the important things to know about Buddhist temples: all movement goes around clockwise. When we visited one of the birth homes of one of the Dalai Lamas in the city, we were walking on the sidewalk around the house and someone told us to walk in the other direction so we were circling the house in a clockwise direction. So even traffic on the street is supposed to go in a clockwise direction! Lil joined the prayer wheel line. Make sure you turn it in a clockwise direction! We visited the monastery just to the north of the city. One of the buildings had had a bad fire and had to be completely redone. When we were there, they were painting some of the intricate and colorful designs that are found in all Buddhist temples. There were about 10 painters, each working on a small section of the wall and brightly colored paint buckets were scattered all around. We were told that on some days there were hundreds of painters. The painters themselves were all from out of town. They are specialized painters who do Buddhist temples and wander around the country working on projects where necessary. The painted walls extend all the way up to the very high ceilings so tall scaffolds are needed. The monastery also had a school for monks where we watched boys from grade school to high school age playing in the courtyard. All of them had shaved heads and the maroon colored monk’s attire. We stopped to chat with some of the older students who seemed eager to meet these foreigners and converse about whatever. Pema had told us that we should try to hire a driver and guide to take us to the countryside and see what the Tibetan landscape was like. So we asked a lady at the youth hostel who knew someone who had a car and could take us. Initially we set it up to go after lunch and agreed to pay the driver 500 yuan for the trip. However as we were eating lunch the weather began to change and it looked like it was going to rain hard in the afternoon. When the lady at the hostel saw us, we asked if it would be possible to arrange the trip for the next day rather than that afternoon on account of the rain. She called the driver and to my surprise he was agreeable to taking the trip on the next morning. In the morning we ran into our two Dutch friends who said that their plans to go watch a sky burial did not materialize because there wasn’t anyone being buried that day. When they expressed an interest in accompanying us on our drive to the Tibetan plateau, I offered that they could come as our guests as I knew that they didn’t have much money. It turned out that the woman at the hostel had also found another guest who wanted to go and had made the arrangement with the driver that he would now charge 120 yuan per passenger. With our party of 4 and the additional passenger, the trip would now cost 600 yuan total. This was fine with us as we had expected to pay 500 yuan. In addition the driver’s girl friend was also along for the ride. At the end when we settled expenses, I offered the driver the 500 yuan that we had agreed to pay the first day but he refused to take more than 480, the fare for our party of 4. He insisted in giving me 20 yuan back for my 500 yuan. In other words the driver refused my tip of 20 yuan. What a surprise! The journey into the Tibetan plateau was very interesting. Initially, it was mostly open plains that looked a bit like Montana or Wyoming. At one point the driver stopped where there were some people with horses and they offered us to go for a ride on a horse. Only our driver took them up on the offer and he went galloping off on a horse, only to end up falling off after a short ride. He told me later that pretty much everyone in Litang knows how to ride horses. We stopped at a small temple or stupa where there were some families with children and many yaks in the field. The children, ages about 3-6, were extraordinarily friendly. As soon as I got out of the car, two of them came up to me and wanted to take my hand and show me around. Soon all of the passengers in the car, especially the obvious visitors, had children leading them by hand or being carried on their shoulders. Unlike other places in Asia where it is common to have children begging for money or food, or selling souvenirs, these children did not seem to be looking for money. Naively, perhaps, it seemed like they were genuinely friendly and wanted to meet us. The scene looked like a classic Tibetan tableau: stupas, monks on motorcycles, yaks in the background, Tibetan kids, and tall mountains in the distance. The scenery then changed into a more mountainous region. There were some scenic perched lakes at the base of tall mountains. We stopped at a couple places with scenic overlooks and stores to buy food or souvenirs. Then our driver went off road in his 4 WD, going through a Tibetan village where there were only dirt tracks. However, he made a mistake on one of the tracks, hit a rock and the car pitched to one side. For a moment I was afraid we might turn over, but instead the car got hung up on a rock and couldn’t move. We all got out and surveyed the situation. We were outside the small village with no one in sight. But our driver was nonplussed. He hauled out a jack and winch from his car and promptly set out to get the car off the rock. The girl friend seemed to indicate that this happened all the time. The driver refused any help so the rest of us went off exploring the area which was very scenic with another perched lake. Sure enough, in about 30 minutes the driver was able to extract the car from its hold and we were back on the way home as it was already late afternoon by then. It turned out that our anniversary was exactly on that day so when we returned to the hostel, the Dutch fellows volunteered to treat us to an anniversary dinner since we had hosted them for the journey into the plateau. We bought a bottle of wine and had a fitting conclusion to the adventure at a nice restaurant in Litang. Since we had to get to Chengdu in 3 days, we didn’t have enough time to visit any of the other cities that Pema had suggested so instead we decided to visit a new national park in Yading, which was only a few hours away. We also learned that one could fly from Daocheng, the highest airport in the world, to Chengdu which would save us a couple days of bus rides to get out of the mountains. Conveniently, Daocheng was located about half way to Yading from Litang. The park in Yading is a beautiful, relatively undiscovered, area. The highlight is the proximity to 3 high sacred mountains whose peaks one can see, in theory, from a meadow. The three mountains are all around 6000 m (18,000+ feet) and Himalayan in character. Unfortunately when we were there all of the mountains were shrouded in clouds but the peaks would sometimes peek out as the clouds moved. While exploring the park, we ran into the German couple Manuel and Caroline from the Tea Horse Inn. They were in the park and making their way to Litang. The last evening we went to Daocheng so we could catch our morning flight to Chengdu and ran into them again on the street. We had a short meal with them while trading stories of our adventures. We bought bus tickets to go from Litang to Yading. The bus is one that starts in Kangding and goes to Daocheng with a stop in Litang enroute. 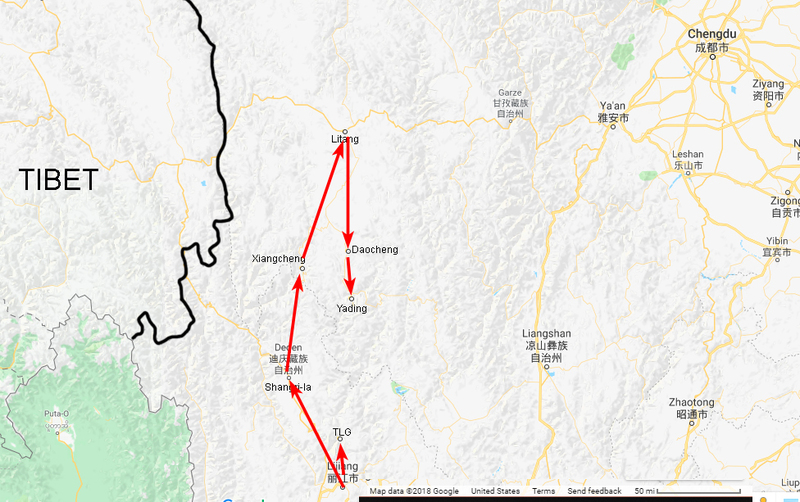 We were told it usually arrives in Litang around 12:30 but we should leave our phone number in case they were able to piece together a minibus earlier in the morning. If we didn’t get a phone call, then we should come to the bus station at 11 or 11:30. When we arrived at the bus station there were many drivers asking if we wanted to go to Daocheng/Yading, but Pema had cautioned us to take the public buses rather than drivers, so we turned them all down. When I bought the tickets, I asked for the public bus ticket and if there were seats available. We were told that the bus company would not know if there were seats available, I think because the system was not computerized, so they didn’t know who would be boarding or getting off. The woman said just a moment and consulted her cell phone on WeChat, I think. Then she told me that there were seats available. I assumed that she had just wechatted with the driver to find out if there were seats. The point being, I was pretty sure that we had bought seats for the bus). We had a long wait but eventually a bunch of buses started arriving at the station. One was bound for Chengdu and I asked the driver if we could take it to Daocheng. He asked how many passengers, when I told him 2, he said he only had space for 1. Then a bunch of passengers all bound for Daocheng said we should get on one of the 9-passenger minibuses. We did that even though we intended to take the big bus which by this time was already in. Another driver looked at my ticket and said I didn’t have tickets for the bus, but rather for the minibus. This was a big surprise. The bus ticket was 60 yuan and we paid 59. So as we settled in the minivan waiting to take off, the driver came on and asked if there was anyone traveling alone. He then pulled the lone passenger off and told him to take the bus to Chengdu which I knew did have only space for 1. But by losing a passenger the driver now didn’t have a full minivan so he went back into station and street to look for another passenger to fill the van. If he wanted to go with a full van, it was not clear why he told the passenger to get off the take the bus. The driver came back a couple time to check on us (and make sure no one left the van, I think) until finally the passengers started complaining and he took off. It was all very mysterious. When I discussed what had happened with one of the other Chinese passengers, he explained that the bus company was trying to get vans to Daocheng because they needed vans there for some airline flights on the following day. He also thought that the driver also worked for the bus company and wasn’t just trying to get more money for himself with a full van. But he also could not understand why the driver had transferred the lone passenger to the bus. The next leg was also odd. We arrived in Daocheng where we had the name and phone number of a driver from the hostel in Litang. So I called him and told him when we were arriving. He met us at the bus station, took us in his car for a block to another car where he announced that his older brother would be driving us to Yading. His brother then proceeded to inch along the street, stopping to chat with all the other drivers hanging around. It seemed like he was looking for another passenger but he did not obviously ask anyone. I couldn’t understand what he was saying to his buddies. Then he made a U turn and proceeded to inch along another street. Whereupon I asked him in Mandarin why he was going so slowly, and he said that he didn’t understand. I assumed he only spoke the local dialect. Later I had a conversation with the Chinese passenger about who would be able to speak Mandarin. He said that people who didn’t go to school would probably not be able to speak Mandarin. However later in the ride it turned out that the driver knew Mandarin perfectly well; when he told me he didn’t understand he was simply refusing to answer my question about why he was driving so slowly. The primary stupa in Daocheng. People can be seen walking around the base and turning prayer wheels as they go. We finally had to leave Yading and western Sichuan as our visa was about to expire. So we made use of the only airport in the region in Daocheng and flew out to Chengdu where we spent two nights before flying to Cambodia and Siem Riep. On the one day we had in Chengdu we visited the fabulous Chengdu Research Base for Pandas which is a fantastic place to see the cute pandas as well as the red pandas. It is an exceptionally well-run zoo, especially compared to the few other zoos I’ve seen in the country. I was so impressed that I made a substantial donation to the zoo to encourage their efforts. Panda on the loose in downtown Chengdu! !